(Rick Egan | The Salt Lake Tribune) Joshua Cameron (left) argues with life-long gun owner Mark Stewart before a town hall meeting in Sandy, where survivors from the Florida school shooting held a forum with Utah students involved with the March for Our Lives movement, Saturday, July 14, 2018. (Rick Egan | The Salt Lake Tribune) Eric Wilson argues with Jason Jackson before a town hall meeting in Sandy, where survivors from the Florida school shooting held a forum with Utah students involved with the March for Our Lives movement, Saturday, July 14, 2018. (Rick Egan | The Salt Lake Tribune) Kish North from South Jordan, points out that he is carrying a weapon, as he argues against gun control, before a town hall meeting in Sandy, where survivors from the Florida school shooting held a forum with Utah students involved with the March for Our Lives movement, Saturday, July 14, 2018. (Rick Egan | The Salt Lake Tribune) Kish North from South Jordan, argues against gun control, before a town hall meeting in Sandy, where survivors from the Florida school shooting held a forum with Utah students involved with the March for Our Lives movement, Saturday, July 14, 2018. (Rick Egan | The Salt Lake Tribune) Joshua Cameron (left) wears a reptile mask to prove a point, as he argues with life-long gun owner Mark Stewart before a town hall meeting in Sandy, where survivors from the Florida school shooting held a forum with Utah students involved with the March for Our Lives movement, Saturday, July 14, 2018. (Rick Egan | The Salt Lake Tribune) Eric Wilson from Salt Lake CIty, (left) argues with Eric Kish North from South Jordan, points out that he is carrying a weapon, as he argues against gun control, before a town hall meeting in Sandy, where survivors from the Florida school shooting held a forum with Utah students involved with the March for Our Lives movement, Saturday, July 14, 2018. (Rick Egan | The Salt Lake Tribune) Mark Stewart talks about his views on guns, as Joshua Cameron listens, before a town hall meeting in Sandy, where survivors from the Florida school shooting held a forum with Utah students involved with the March for Our Lives movement, Saturday, July 14, 2018. (Rick Egan | The Salt Lake Tribune) Darnell Crandall of Salt Lake City, discuss his views on guns, before a town hall meeting in Sandy, where survivors from the Florida school shooting held a forum with Utah students involved with the March for Our Lives movement, Saturday, July 14, 2018. (Rick Egan | The Salt Lake Tribune) Michelle North, from South Jordan, displays her sign and her weapon, before a town hall meeting in Sandy, where survivors from the Florida school shooting held a forum with Utah students involved with the March for Our Lives movement, Saturday, July 14, 2018. (Rick Egan | The Salt Lake Tribune) Eric Wilson is challenged by 5-6 pro-gun advocates, before a town hall meeting in Sandy, where survivors from the Florida school shooting held a forum with Utah students involved with the March for Our Lives movement, Saturday, July 14, 2018. (Rick Egan | The Salt Lake Tribune) People on both sides of the issue discuss their views on guns, before a town hall meeting in Sandy, where survivors from the Florida school shooting held a forum with Utah students involved with the March for Our Lives movement, Saturday, July 14, 2018. (Trent Nelson | The Salt Lake Tribune) Sam Robinson of Utah Gun Exchange asks a question of student activists involved with the March for Our Lives movement at a town hall at the Mountain America Expo Center in Sandy, Saturday July 14, 2018. (Trent Nelson | The Salt Lake Tribune) Sam Robinson of Utah Gun Exchange asks a question of student activists involved with the March for Our Lives movement at a town hall at the Mountain America Expo Center in Sandy, Saturday July 14, 2018. (Trent Nelson | The Salt Lake Tribune) Student activists involved with the March for Our Lives movement speak at a town hall at the Mountain America Expo Center in Sandy, Saturday July 14, 2018. (Trent Nelson | The Salt Lake Tribune) Student activists involved with the March for Our Lives movement spoke at a town hall at the Mountain America Expo Center in Sandy, Saturday July 14, 2018. Alex King, Chicago. (Trent Nelson | The Salt Lake Tribune) Student activists involved with the March for Our Lives movement spoke at a town hall at the Mountain America Expo Center in Sandy, Saturday July 14, 2018. Emma Gonzales. 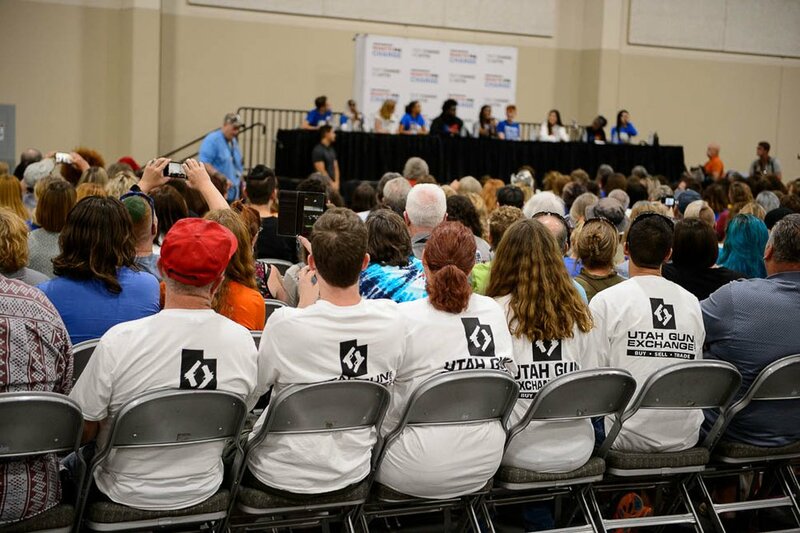 (Trent Nelson | The Salt Lake Tribune) Utah Gun Exchange t-shirts in the audience at a town hall put on by the March for Our Lives movement at the Mountain America Expo Center in Sandy, Saturday July 14, 2018. (Trent Nelson | The Salt Lake Tribune) Student activists involved with the March for Our Lives movement are applauded at a town hall at the Mountain America Expo Center in Sandy, Saturday July 14, 2018. (Trent Nelson | The Salt Lake Tribune) Student activists involved with the March for Our Lives movement are applauded at a town hall at the Mountain America Expo Center in Sandy, Saturday July 14, 2018. (Trent Nelson | The Salt Lake Tribune) Student activists involved with the March for Our Lives movement are applauded at a town hall at the Mountain America Expo Center in Sandy, Saturday July 14, 2018. (Trent Nelson | The Salt Lake Tribune) Student activists involved with the March for Our Lives movement are applauded at a town hall at the Mountain America Expo Center in Sandy, Saturday July 14, 2018. (Trent Nelson | The Salt Lake Tribune) Student activists involved with the March for Our Lives movement speak at a town hall at the Mountain America Expo Center in Sandy, Saturday July 14, 2018. (Trent Nelson | The Salt Lake Tribune) Student activists involved with the March for Our Lives movement are applauded at a town hall at the Mountain America Expo Center in Sandy, Saturday July 14, 2018. 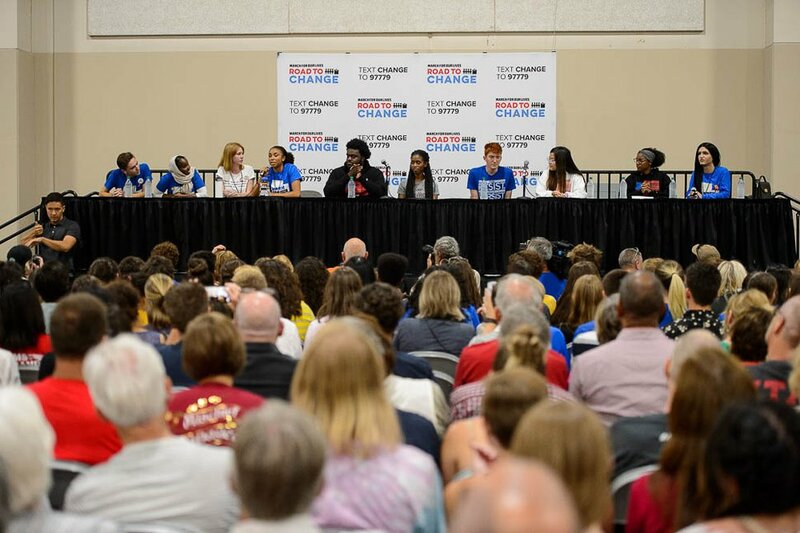 (Trent Nelson | The Salt Lake Tribune) Student activists involved with the March for Our Lives movement spoke at a town hall at the Mountain America Expo Center in Sandy, Saturday July 14, 2018. Kyrah Simon. It was the fifth question in. And they’ve answered it before. Many times before. One man booed at the answer. This time, the crowd erupted in cheers and jumped to its feet. A few people yelled at the booing man to “shut up.” Some held up their hands in the shape of a heart. Most applauded the Parkland, Fla., students who survived a mass shooting that killed 17 people at their high school on Feb. 14. As part of a national tour, the students spent Saturday at a town hall in Utah on the five-month anniversary, talking about the movement for gun reform that came next. Simon and Deitsch and eight others from Marjory Stoneman Douglas High School have been traveling the country by bus to register young voters, challenge members of Congress and advocate for firearm restrictions. The “Road to Change” bus tour organizers chose Utah — a pro-gun stronghold — as a destination on their road trip because of its all-Republican federal delegation and hearty support of the National Rifle Association. The evening event was held at the Mountain America Expo Center in Sandy, purposefully inside the district of Rep. Mia Love, R-Utah, who faces a tough midterm bid for re-election and whom the students have called out for accepting NRA donations ($3,000 over her two terms in office). Inside, the folding chairs were filled with Salt Lake City teenagers and parents who were excited to hear the Florida survivors speak and ready with questions to ask. A long line stretched around the lobby to get in, which included Mayor Jackie Biskupski. About 30 people, though, remained outside during the town hall to protest, with signs quoting the Second Amendment and America’s forefathers. Some had handguns on their hips and were barred from entering the building (where firearms were not allowed). “I cannot protect my kids if they take my guns away,” said Mike Williams, 36. “They just want to ban all guns,” added Trevor Warner, 37. (Trent Nelson | The Salt Lake Tribune) Utah Gun Exchange t-shirts in the audience at a town hall put on by the March for Our Lives movement at the Mountain America Expo Center in Sandy, Saturday July 14, 2018. Many of the counterprotesters wore white T-shirts from the Utah Gun Exchange, an online firearms business, which encouraged its members to attend the gathering. The company’s executives have recently taken a military-style armored vehicle across the country to follow the Parkland students on tour (though they did not bring the car Saturday). The day after a Salt Lake Tribune article detailed those efforts, Larry H. Miller Megaplex Theatres pulled out of an agreement to host the survivors’ town hall, fearing “a potentially contentious situation.” Utah Gun Exchange also had led a pro-gun protest ahead of the massive March for Our Lives rally last spring in Salt Lake City. As they did then, the two groups brushed shoulders Saturday. Some people walking inside for the student panel stopped and argued with the pro-gun activists. One man shouted, “My gun sits right here at my side and doesn’t jump up and shoot anyone.” Another responded, “You are so uneducated.” One couple walked away shaking their heads. “Civility is long gone,” the husband declared. But apart from those few tiffs — and with tens of police officers patrolling — the event was largely peaceful. Simon and Deitsch were joined onstage by five Utah students who have led the local arm of the movement and organized the event. The students criticized Utah’s lawmakers — including Gov. Gary Herbert, Sen. Mike Lee and state Senate President Wayne Niederhauser — saying they have aligned too much with the National Rifle Association and haven’t done enough to protect against gun violence in schools. “If the money is backing up their campaign, they’re not going to go against that because that’s how they secure their job,” said Brighton High graduate Isaac Reese. He encouraged audience members to use their vote as their voice on gun reform. “Yes!” the crowd shouted back. (Trent Nelson | The Salt Lake Tribune) Student activists involved with the March for Our Lives movement speak at a town hall at the Mountain America Expo Center in Sandy, Saturday July 14, 2018. One student asked the panel why it is focused on gun reform instead of underage drinking. “This issue has forced youth to grow up quicker that we deserve,” responded Saida Dahir, of Salt Lake City, who attends the Academy for Math, Engineering and Science. She was backed up by Deitsch. “I’d like to clarify,” he said, “we’re not asking any law-abiding citizens to give up their guns." The Florida and Utah students had many of the same answers and many of the same fears. They, too, had the same convictions. “We realized that we could use our pain and our suffering and turn that into action," Simon said. Eva Uribe was No. 12 in line to ask a question. As she walked up to the microphone, which was too tall for her, she rolled onto her tiptoes to speak into it and admitted she was pretty nervous. “It’s a very real situation that we have to think about,” she said, explaining how she checks for exits now when walking into her classroom. And then Uribe, a ninth-grader in Salt Lake City, asked: How can we stop being afraid to talk about school shootings? The panelists told her to use her fear as motivation. They told her to start a conversation wherever she can. “They’re distracting from the message,” he said. March for Our Lives advocates for a range of gun reforms, including universal background checks, boosted funding for research on gun violence and banning high-capacity magazines and semi-automatic assault rifles.